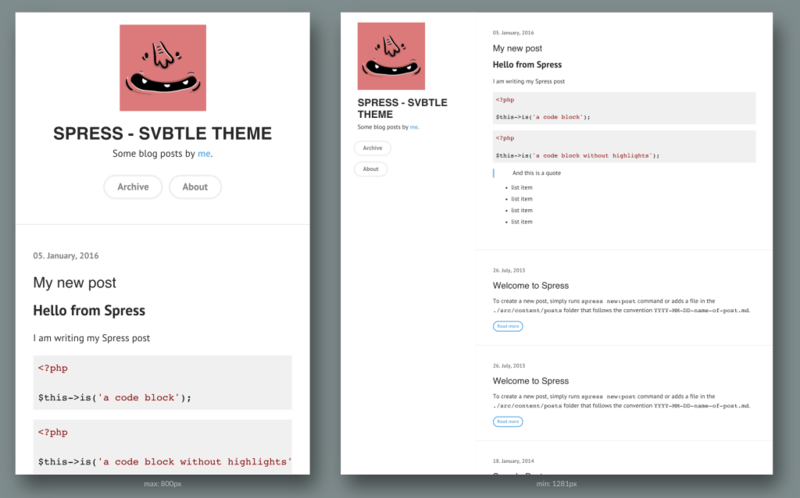 Building an Spress Svbtle Theme – Responsive Static Blogs! 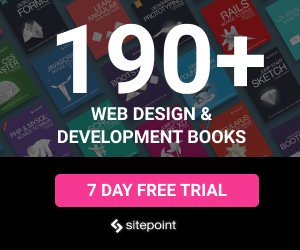 You may have heard of Sculpin – a static site generator for PHP. Static blogs are, as you may know, blogs which you dynamically write in your app or on your local machine, and then export as a pure HTML version for hosting on static-only servers, for speed, reliability, and offline-first friendliness. While easy to use and fast to set up, Sculpin’s development has stagnated a bit and the documentation leaves much to be desired. Spress is, in a way, its spritual successor. Much better documentation, much more flexible configuration, much easier to extend, and just as easy to use with almost the same API and commands. 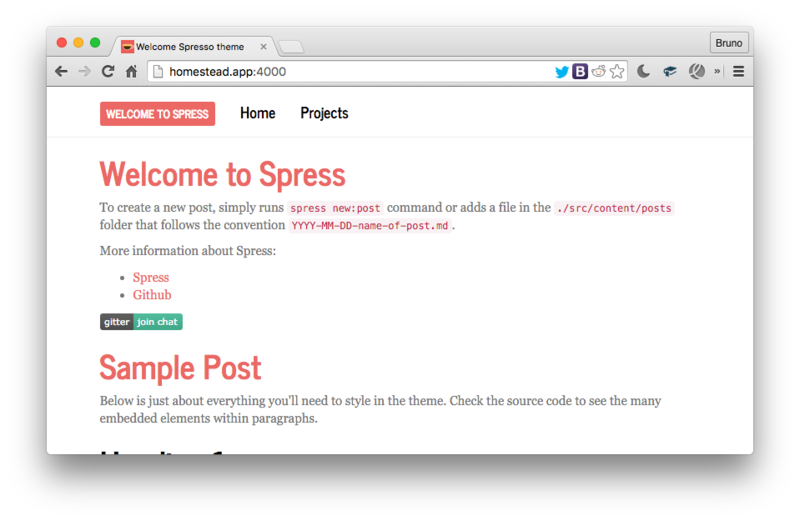 In this tutorial, we’ll be building an Spress setup for generating a static blog with a custom theme. If you’re familiar with Sculpin, this setup will be almost muscle memory. Just like Sculpin, Spress also supports a --server option to start PHP’s built-in server, and the --watch option which watches files for changes and rebuilds the site as needed. We’ll rebuild the Svbtle theme to work with Spress. For more general information about themes in Spress, see here. The content block is right there, ready to receive the converted MD content. Apart from the basic Twig syntax, we can see that this layout itself has some frontmatter as well. These are nested layouts in action: while our “Welcome to Spress” post extends post.twig, post.twig itself extends default.twig – the default layout which defines the CSS, JS, and other elements common to all pages / posts. Thus, we can see that the layout system of Spress is practically identical to regular Twig usage, with the sole difference that Spress uses frontmatter for defining inheritance. What building a theme comes down to, then, is just putting the right CSS / JS into the right locations and altering the Twig templates slightly. First, let’s put some new CSS into the mix. Download this file into /src/assets/css. Then, grab a profile image or logo (if you don’t have one, use Adorable Avatars) and save it as src/assets/img/profile.png. Anything you place in src/assets gets copied over into /assets at build time. In addition to a theme change, we added nice little hack into the mix as well – while rendering content, Spress will look for the <!--more--> HTML comment in posts. If it encounters it, it will only render the content before it on the main page, and will summon a “Read more” button underneath. Clicking it, the reader is taken to the post’s full page and continues reading. Many thanks to @coderabbi for this hack. Rebuild the site now with CTRL+C to stop the server and spress site:build --server to serve it, and we should see our newly made theme applied – it’s as simple as that! Note: while building themes is relatively easy, installing them is a bit counterintuitive. 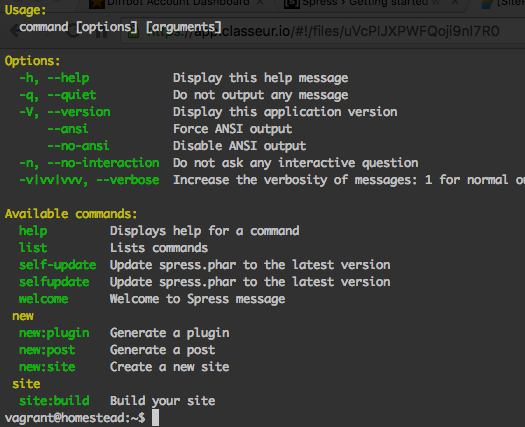 To install a theme, one must effectively clone a new Spress site, and then paste the MD sources into it. This tends to be awkward due to different file structure used across themes but as you can see above, it usually doesn’t involve much work. 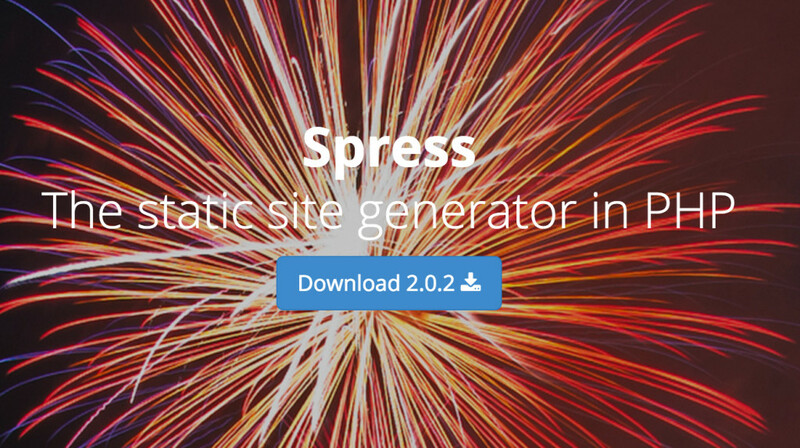 In this tutorial, we looked at Spress, a static site generator written in PHP with Symfony components, and generated a custom themed blog. In a followup post, we’ll look at more of its features – including taxonomies (categories and tags), custom pages, and deployment, and we’ll write a plugin or two. Do you use a static or a dynamic blog? Why? Have you tried Spress or are you still on Jekyll, Sculpin, or a similar tool? Let us know!